This Christmas seems to be the busiest I've had in a long time. Between the buying, wrapping, and getting food ideas and dishes together, I've barely had time to blink! 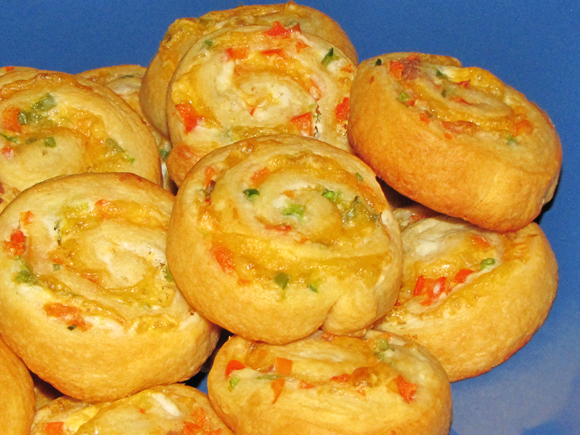 In the course of all the prep work, I did a trial run of these little pinwheels. It's a quick and easy appetizer that would be great for the family get-togethers and won't keep you spending all your time in the kitchen. Not only is there a little kick to help jumpstart the tastebuds, but it's a great finger-food that the whole family will enjoy. 2. Mix cream cheese, parmesan cheese and milk together. Set aside. 3. Mix jalepeno, cheddar, red pepper, and onion. Set aside. 4. Unroll crescents and separate into four rectangles. 5. Seal two of the four rectangles to form one larger rectangle. Do the same with the remaining two rectangles. 6. Spread the cream cheese mixture evenly over each large rectangle. 7. 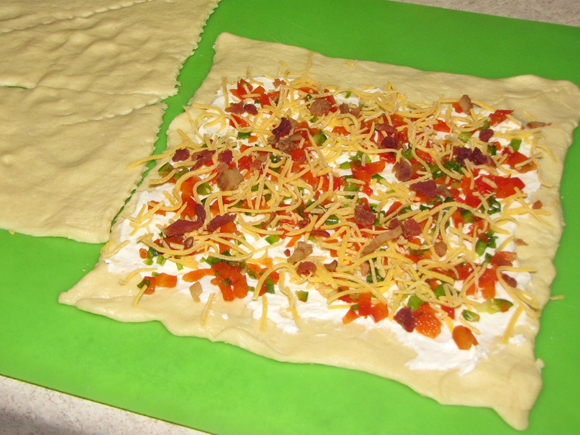 Sprinkle vegetable/cheese mixture over the cream cheese leaving a 1/2" border on the long sides. 8. Starting with the long end, roll the crescent until you reach the other end. Roll tight, but not too tight. 9. Using a sharp knife, cut each roll into 1/2" pieces. 10. Lightly grease a foil-lined baking sheet and place the pinwheels cut-side down. 11. Bake for 12-15 minutes or until golden. *Variation: I added about 1 TB chopped, cooked bacon to one of the sides. It added a nice, smokey flavor.